Maintenance and troubleshooting for the Brockwood Stall Shi*fter manure and bedding sifter. Symptom: The motor doesn’t come on when I switch it on. Make sure the power cord is plugged into a live receptacle. Make sure you connected the motor to the switch (step 13 in assembly). Unplug the motor from the switch and plug it into another known good extension cord, which is plugged into a known good receptacle. 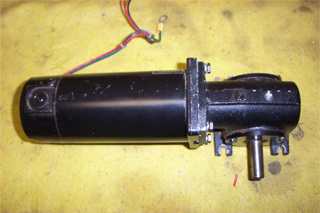 (AC Machines only) If the motor still does not turn the problem is a bad motor. If the motor turns when plugged into a known good source the problem is the switch. On variable speed models there is a red power on indicator on the control panel. If it is not illuminated there is either a blown fuse or the machine is not plugged into a live power source. If the control panel fuse is blown replace it with a 5 amp AGC fuse. If the fuse blows again there is something wrong inside the control box and you will need to call us for further instructions. If you open the DC Control box without consulting us you will void the warranty. 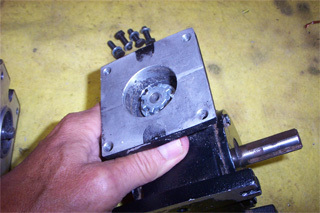 Check for play in the connecting rod connection at the screen.Check for end play in the connecting rod end at the crankshaft. If there is no play is in the connecting rod after all the above have been checked and they are tight it is possible that the connecting rod is not running parallel to the floor as called for in the assembly manual Step 11. Sometimes when the shifter is not sitting on all four wheels it will set up a noisy harmonic. Try changing positions in the stall. Symptom: I hear a squeaking sound when the machine is in operation. Put a drop or two of 30 weight oil on both tie rod ends. If squeaking persists put a drop or two of oil on all roller bearings. Lower the rear screen roller to the bottom hole in the roller hanger. Make sure the machine is parked on a level spot on the stall floor. Reverse the positioning of the machine from front to back. Each stall has a spot where the machine works best, find that spot and use it. Symptom: The screen is moving slowly or not at all but it sounds like the motor is turning. Refer to the pictures for the following steps. 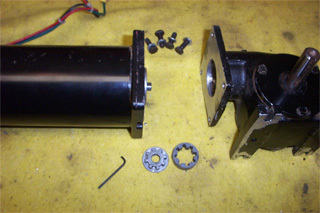 Separate the motor from the gearbox by removing the four 7/16 x 1 inch hex head screws. Look closely at the motor spline. 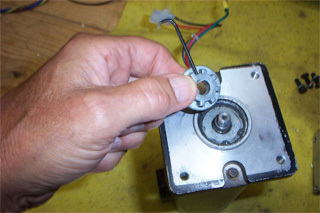 It should be held tightly to the motor shaft at the FLAT SPOT on the shaft with an allen head set screw. Check both the motor spline and the gear box spline. Normally the gear box spline is fine but the motor spline has play. This play is usually caused by a hairline fracture in the pot metal spline right at the set screw hole. This causes the spline to slip off of the flat spot and the motor shaft to spin doing no real work. 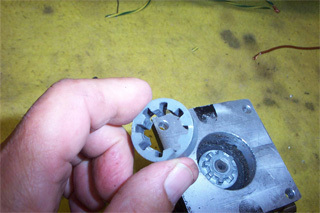 Loosen the allen head set screw on the motor spline with a 1/8 inch allen wrench and remove the spline. Replace the spline with a new one and using the same allen head set screw tighten the spline onto the motor output shaft. Put a drop of blue Locktite on the set screw to keep it from backing out. 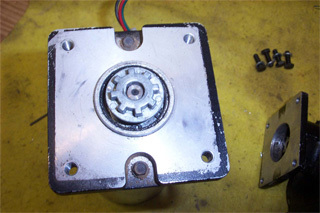 Refer to the pictures to make sure the gearbox and motor are oriented in the proper position before tightening all four screws. Reverse the operations in steps 4 back through 1 and your Stall Shi*fter should be as good as new. Plug your machine back in and turn it on.